The American Historical Association, the world's largest association of historians, has written to Treasury Secretary Steven Mnuchin in support of its campaign to confirm Harriet Tubman on the $20 bill. Read AHA Executive Director James Grossman's letter of August 13th. 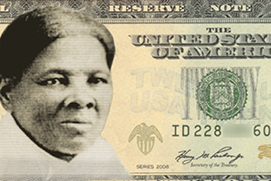 Several faculty from the UT History Department signed an August 7th letter to Secretary Mnuchin as well, as part of “Historians for Tubman on the 20,” a group of American historians advocating to ensure Harriet Tubman will replace Andrew Jackson on the $20 bill in 2020. Professors Daina Ramey Berry, Jacqueline Jones, and Juliet E.K. Walker, are among the 125 signers of the letter, penned by Professors Catherine Clinton, UT San Antonio, and Elizabeth Cobbs, Texas A&M University. Since sending the letter, Clinton and Cobb have gone on to discuss their efforts on WNYC's Brian Lehrer Show. Listen to the show here, and follow developing news on Twitter from the historians behind the effort, at: @Elizabeth_Cobbs. See also: “A Rare Photo & Royal Shawl Honor Harriet Tubman's Strength & Bravery,” by Daina Ramey Berry, part of the A+E Network series on Black History Month she curated in February, 2018.